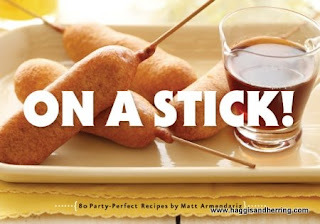 I was sent a second cookbook by Quirk Books - On a Stick: 80 Party-Perfect Recipes by Matt Armendariz. It's an excellent idea, great for parties any time of the year. Especially parties with people walking around. A great way to serve all sorts of different treats to guests without the trouble of extra plates everywhere. Once I opened it up I was surprised to find so many recipes required deep-frying. The half-dozen people I showed the book to had the same comment. But don't let that dissuade you. From the classic corn dogs, breakfast sausages dipped in pancake batter, deep-fried ravioli, chicken tenders in waffle batter, to the deep-fried mac 'n' cheese and spaghetti and meatballs (the list goes on), they all look super-appetizing; just nothing I'd dare make myself (I'm not much of a deep-fryer). Most of them wouldn't be out of place at an upscale gallery opening. But the offers do go beyond the deep-fried into fresh cheeses, vegetables, grilled offerings, and crazy-good desserts. Some of the ones that stand out include Spam and pineapple skewers, grilled sweet potato wedges, mojito melon skewers, frozen Elvis (chocolate covered bananas with nuts and bacon), cake pops (an upcoming trend at your nearest Starbucks), cheesecake, and even margarita Jell-O shots. Meredith was so excited to see them and immediately started choosing which ones would be made for backyard parties. Needless to say, I now have quite an inventory of sticks and skewers sitting in a drawer! The last few weeks have been very busy (and cold), so the frozen desserts on a stick will need to wait. But our eldest son knew exactly what he wanted - pizza on a stick. It was quite a simple recipe - make a 12x12 square sheet of pizza dough, top it with sauce and cheese, and roll it. Slice the roll and bake on a sheet. Meredith got a little over-excited and skewered them before baking (instead of after). They were a perfect special treat for lunch. Meredith's pizza on a stick. The pizza on a stick in the book looked much prettier, but we'll attribute that to a different style of dough. This dough recipe was a quick no-yeast recipe and we were starving, so we didn't give it any time to rise. Still, it tasted great and we'll definitely be making it again. Overall, On a Stick is a great book for anyone who frequently needs ideas for parties, and it's also a great conversation piece. I'm glad that it now occupies a place on my cookbook shelf. Love Matt's recipes and photos...looks like a really fun book! Pretty cool concept really- and great unique book idea! Pizza on a stick- that should take off on the fairgrounds! Great book - i actually love stuff on a stick - even vegetable on a stick are so much more fun. Nice post! Its a great idea. Appetisers on a stick are easy to eat and kind of fun at a party.